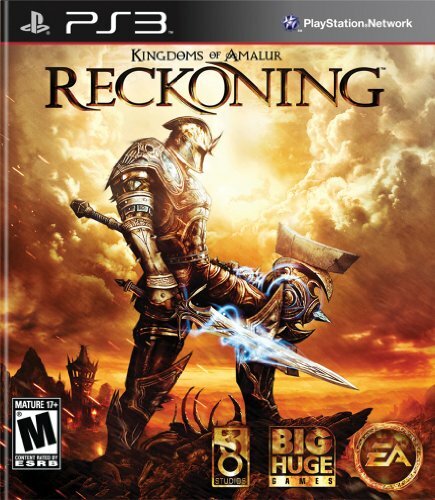 Kingdoms of Amalur: Reckoning is a single player Action Role-playing Game (RPG) set in the brand-new game fantasy universe of Amalur. The game features an expansive Open World game environment, the unique "Destinies" system that limits character development only by the combination of equipped spells and items carried, intuitive yet challenging combat, a robust crafting system and a range of special attacks. Additional features include: the written and design talents of R.A. Salvatore, Todd McFarlane and Ken Rolston; dramatic special and metered attacks; as well as multiple in-game races. Kingdoms of Amalur: Reckoning takes place in Amalur, an all-new game universe inhabited by various races of beings and filled with thousands of years of history. This deep fantasy based world is the brainchild of best-selling Fantasy and Science Fiction author R.A. Salvatore and the combined talents of Todd McFarlane, the creator of the Spawn series, Ken Rolston, the lead designer of The Elder Scrolls III: Morrowind and The Elder Scrolls IV: Oblivion, and the team at Big Huge Games. Reckoning bears the hallmarks of each of these visionaries, melding an epic, master-crafted storyline, rich graphics and heart-stopping animations, and compelling open-world exploration. In addition to being the setting for Reckoning, this rich world will also serve as a base for a future trans-media entertainment experience, including books, toys, comics, and a planned MMORPG (Massively Multiplayer Online RPG) video game yet be announced. Kingdoms of Amalur: Reckoning is a single player Action RPG that blends a new approach to character development with intuitive, yet challenging real-time combat. Characters enter the game as something of a blank slate after they are resurrected from death by the mysterious "Well of Souls" following a grand in-game conflict. Spurning the rigid character class systems commonly used in RPGs for the development of characters, the game instead focuses on player-shaped "destines" which hinge on the chosen combinations of abilities and equipped items and weapons attached to their character as the game progresses. With no traditional classes these are blended as the play wishes. This along with a large item inventory limit and a robust crafting system for creating new items, allows for a nearly limitless number of possible character paths, or destinies. Anda baru saja membaca artikel yang berkategori Amalur dengan judul Kingdoms of Amalur: Reckoning. Anda bisa bookmark halaman ini dengan URL http://newhardwaresoftware.blogspot.com/2012/10/kingdoms-of-amalur-reckoning.html. Terima kasih!